I have never considered myself a stalker! 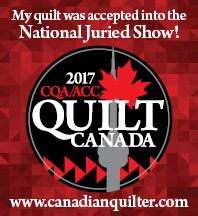 Well, that is, until I discovered Sue Garman and her amazing, amazing quilts! I had heard of Sue Garman, but it was not until I saw an ad in a quilt magazine for her Block- of- the- Month, “Ladies of the Sea”, that my jaw hit the floor! I was awestruck. I had to meet her! I emailed her and asked her how she stays motivated. She gave me the best advice….only work on quilts that you absolutely love, not sort of love, not kind of love….just absolutely love! I absolutely love Friends of Baltimore (another one of Sue’s BOMs) so it is easy to stay motivated! I was lucky enough to meet Sue Garman a couple of years later at Quilt Market. I told her I was her biggest fan and she giggled! I wonder if she knows how much of an inspiration she is? The fuchsias on this block are actually dimensional which makes the block interesting. Here is how you make them..
Make 2 circles using the 1 1/4″ Perfect Circle. Use a light and dark fabric and make sure you use matching thread. Fold one of the circles in towards you and pinch with your fingers. Take the second circle and fold it around the first circle. Take a few stitches to hold the petals in place. Thread an embroidery needle with a couple strands of embroidery floss. I used yellow. Knot the thread and stitch through the back to the opening at the top of the flower. The knots will be on the back of this unit. Cut the thread an inch or two from the flower. Repeat this step a couple of times. I used the starch method on the calyxes, so that means the seam allowance is already turned over. Now I can just glue it in place at the base. Lift up the opening and tuck the flower under the calyx and glue in place. Easy peasy! A few of the quilts I am working on have one thing in common: lots and lots of circles! Let me tell you about “Perfect Circles”, a product that should be in every quilters toolbox. I would not attempt to make an appliqued circle without them! “Perfect Circles” is a set of Mylar circles that range in size from 1/2″ – 2″ in diameter. They are very easy to use but over the years I have come up with a few tips that I would like to share with you. The very first (and most important) tip is that when you have a lot of circles (like 98!) you need some sort of motivation!! I am prepping my fifth block of Sue Garman’s Friends of Baltimore and just about fainted when I saw 98 fairly small circles! So I came up with a plan. Every time I completed 20 tiny purple circles, I would reward myself with a few chocolate covered cranberries!! Let’s be honest…chocolate covered anything would work!! 1. Trace the circle on to the wrong side of the fabric. You can layer your fabric and cut more than one circle at a time. 2. Cut the circle out leaving a decent 1/4 inch seam allowance. 6. Gently pull the thread so that the seam allowance gathers around the Perfect Circle. I like to pull the thread towards myself. 7. Use a paint brush in your left hand to dab some spray starch onto the seam allowance. It should be moist, not wet. You should still be holding onto the thread with your right hand. Take a breath at some point! 8. With your left hand, use your mini-iron to press the seam allowance flat against the Perfect Circle. You should still be holding the thread tight. Turn the circle over and press with your iron to make sure that the fabric is absolutely dry. 9. Very gently, pry open the circle where the knot and thread meet. Remove template. 10. Very gently, pull the thread so that the seam allowance lies perfectly flat again. 11. Knot the thread or take a few back stitches to make sure the seam allowance stays in place. 12. Clip the thread and press one last time! Isn’t it perfect?? 13. Repeat 20 times and have some chocolate!!! I had my day all planned….. I would sit by the window hand-quilting Amy’s quilt, sipping tea and listening to my new audiobook that I downloaded. Sounds delightful, doesn’t it? Well, Bruin had other plans for the quilt! So I thought it was best to let sleeping kitties sleep! What else could I do? I decided that I would dig out my Challenge blocks from a few years ago. These blocks have been calling my name for a while and I cannot resist them any longer! There are nine blocks in total and they are 18″ square. My thought at the time was just to make the blocks and then see if they speak to me!! (Believe it or not, some of my best conversations are between my quilts and I!!) I sat and stared at them for a bit (while I sipped my tea!) and I have actually come up with a plan!! I noticed that the yellow points of the stars do not show up like I thought they would. My first thought was to rip them out and replace them with blue points. You know, I just didn’t see that happening! My next thought was to applique a circle on to each of the yellow points. So after auditioning a dark, medium and light pink circle, I decided I liked the subtleness of the light pink circles. I am using Karen Kay Buckley’s “Perfect Circles”. So I started to cut out 72 (yikes!) pink circles and I am now in the process of stitching them on to each yellow diamond. So far I love it! The next step will be to stitch the blocks together in three rows of three. Once that is done, I will applique something pretty in the white spaces between the Feathered Stars. And then, of course, it will need an appliqued border which I have percolating in my head! And I do picture a scalloped outer border with a stripey binding!! But for now, I am appliqueing 72 (yikes!) little circles! !